After putting up a cool £1 million and welcoming more than 1,000 players late last week, the Sky Poker UK Poker Championships has finally crowned a winner. A tense day of action inside Nottingham's Dusk Till Dawn saw 31 players return for a shot at glory, but when the betting was done only one could walk away with the £200,000 top prize. Leading the action at the start of the session was Matas Cimbolas. The in form player has already made a string of final tables this year and managed to start the day with almost 6 million chips which was enough to put him comfortably ahead of Tom Hall in second. However, as the session wore and the final table approached, Cimbolas wasn't able to maintain his chip lead and gradually slipped into the middle of the pack. Indeed, by the time the final table rolled around, Cimbolas was left tussling with the likes of John Kalmar and Jamie Clossick at the bottom of the chip counts while Hall controlled things at the top. That dynamic wasn't in place for long, however, as the finale saw some dramatic twists and turns which eventually ended with Fraser Bellamy taking control of the action. 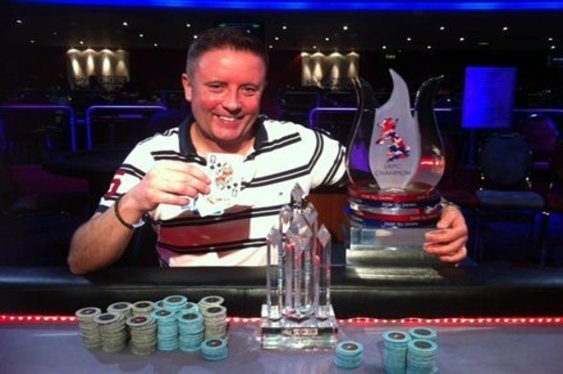 The British grinder was able to assume the chip lead three-handed and after taking out David Lloyd in third place, Bellamy managed to dispatch with Chris Vernon within a few minutes. An all-in and a call saw Bellamy table pocket queens leaving Vernon looking for some help with A-4. Unfortunately, as the board ran out 7, 3, J, 2, Q there was nothing more Vernon could do and as the he slipped into the shadows, Bellamy stood victorious as the latest Sky Poker UK Poker Championship victor and £200,000 richer.